I started using Facebook recently, and quite frankly, they are annoying me.Here's one way. 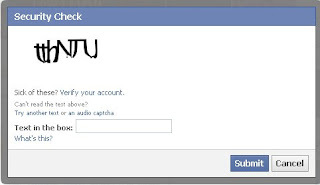 I press the Like button on something, and am presented with the common captcha dialog whose usual purpose is to verify that I am human and not some sort of robot or screen scraping program. I pressed Like on several items yesterday, from the same browser window each time, and had to figure out an unreadable string like this one more times that I cared to. It seems strange to me that Facebook believes a robot had taken over the connection I had already verified as having a human operator. Whatever. 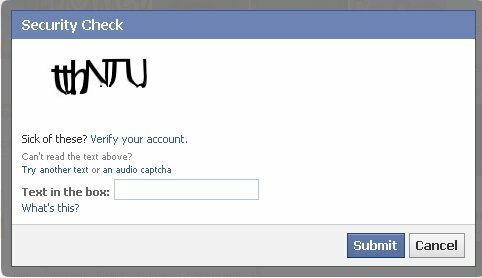 Facebook seems to understand that this gets really old really fast, and the first text in the captcha dialog is "Sick of these?" 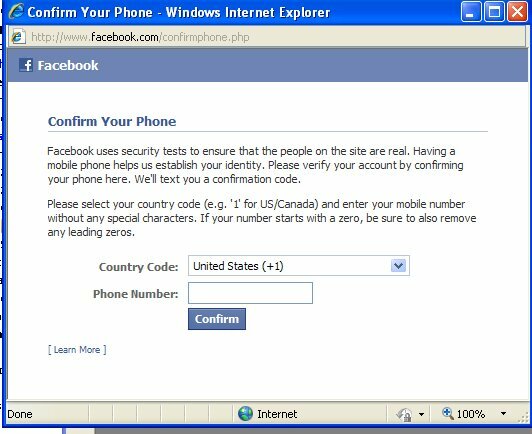 Clicking that link opens this window where one is encouraged to supply a mobile phone number so they can text a confirmation code. I have two complaints with this. First is, I don't text, and don't have a text plan on my phone. I'm suppose I'll get a text if they send it. Probably. And my provider will be happy to charge me for that. More interesting, though, is that any one-time text to my phone will do nothing to meet the useful goal of the captcha - which is to very that I am not a robot that pressed Like. For this to have that value, they would need to text me a confirmation every time I press Like, just as they are presenting the captcha every single time. I hope they're not planning to text me that often - as I mentioned above, I don't have a text plan. I've confirmed with another Facebook user that she doesn't get confirmation texts with every post, so FB clearly don't feel the need to verify a human every time. 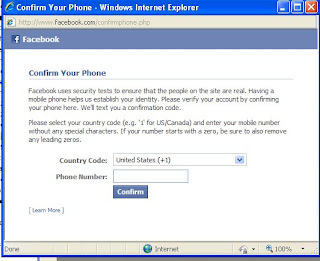 Why, then, do they present a captcha every time, other than to maximize pain and further incent me to give up my cell#?